In January, the Graphic History Collective (GHC) launched Remember | Resist | Redraw: A Radical History Poster Project, a year-long artistic intervention in the Canada 150 conversation. Earlier this month we released Poster #10 by Chris Robertson and Lorene Oikawa, which points out that Canada 150 also marks the 75th anniversary of Japanese Canadian Internment. In fact, it was 75 years ago (30 September 1942) that Japanese Canadians, who were being detained at Hastings Park in Vancouver, were sent to internment camps. At first glance, the image on the front of this poster appears to be a simple snapshot of a group of workers (the artist’s grandfather is the man with glasses in the centre front row). What makes the image unique, however, is that it is a rare photograph of Japanese Canadian men who, in 1942, were removed from their families and forced to work on highway projects across Canada. 2017, Canada’s 150th birthday, also marks the 75th anniversary of Japanese Canadian Internment. In 1942, the federal government labeled 22,000 Japanese Canadians (over 75% were Canadian citizens) “enemy aliens.” In response to Japan’s attack on Pearl Harbour in 1941, Canada declared war against Japan. Soon after, without any charge or due process, the government forcibly relocated Canadians of Japanese heritage living on the West Coast to internment camps in remote areas of British Columbia and other parts of the country. The RCMP also shut down Japanese Canadian schools and Japanese language newspapers. To pay for internment, the government seized and sold the land, property, and belongings of Japanese Canadians without the owners’ permission and at a fraction of the value. 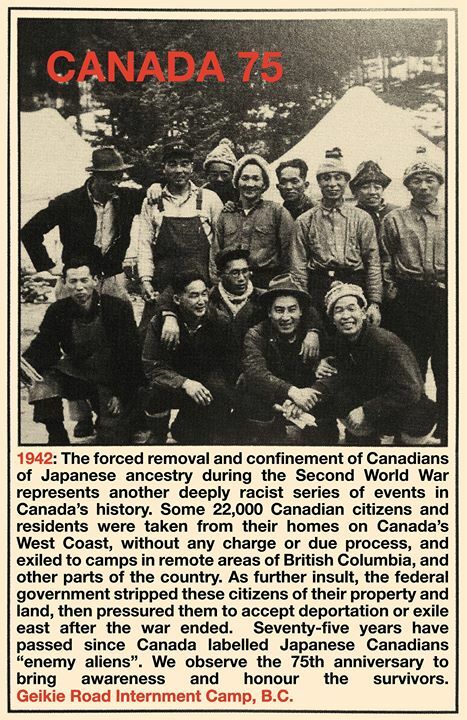 Prior to internment, people of Japanese descent, like Indigenous and other racialized peoples, faced a significant amount of racism in Canada. In the late nineteenth century, cheap labour was the impetus for recruiting workers from Japan. The workers were lured with stories of easy money and exaggerated living conditions. They came and worked in the fishing, mining, and lumber industries and on the construction of the railroad. They built up their savings and got into farming and business. Despite Japanese Canadians’ increased contributions, many white settlers viewed their hard work and tenacity as a threat. The Canadian government implemented a number of racist policies, including restricting Japanese immigration and denying Japanese Canadians the right to vote. When Canada declared war on Japan, it took little to convince other Canadians that people of Japanese descent were “enemy aliens” who should be interned, even deported. On 16 January 1942, Canada created a 100-mile-wide “protected area” on the west coast of British Columbia. One month later, starting on February 26, Japanese Canadians were forced to leave their homes, most with only 24 hours’ notice. Families were told they could take two suitcases, but they were not informed where they were going or for how long. Over 8,000 people were detained at Hastings Park before being sent to internment camps in the ghost towns of the BC Interior between March and September 1942. In the camps, many families lived in tents or in shacks quickly built with inadequate materials. Many were without their men who had been sent away to build highways in BC, Alberta, and Ontario. Some men who spoke out against their unjust treatment, including those who organized work stoppages at road camps, such as Geikie, were sent to a prisoner of war camp in Angler, Ontario. Some families, in order to stay together, were sent to work on sugar beet farms in Alberta and Manitoba that were experiencing labour shortages. Just before World War Two ended, the government forced Japanese Canadians to agree to move to eastern Canada or be deported to Japan. Of the 4,000 who agreed to go to Japan, half had been born in Canada. While the war officially ended in 1945, the government did not allow Japanese Canadians to return to the West Coast until 1949. There was nothing to return to, however. Japanese Canadians had to start over from scratch. Years after they had rebuilt their community, in 1980 Japanese Canadians began to formally organize for redress. In 1988, the federal government finally apologized for its actions during the war and made a promise that such treatment will not happen again. Yet after 11 September 2001, many Japanese Canadians experienced a sense of déjà vu as they watched people label all Muslims “terrorists” without evidence. The increasing intolerance of immigrants and rising levels of Islamophobia in Canada and around the world are disturbing, with the rhetoric being used sounding very familiar to what was said about Japanese Canadians in 1942. It is unacceptable. Today, the Japanese Canadian community continues to speak out against racism and to work with other communities to share our history in hopes of preventing new injustices. Our family owned a small strawberry farm for over thirty years in Mission B.C. before the war. My grandfather is the man with the glasses in the centre front row in this photo from the Geikie Road Camp where he was forced to work. There was something I found powerful in their smiling and not smiling faces in the midst of their struggle. This photo is from an archive – it is not our own. As part of the litany of injustices they experienced during that time, my family was dispossessed of many things: our freedom, property, language, and culture, but most importantly, our history. My family’s story is a Canadian story that is at odds with this nation’s historical narrative, culture, and identity. A footnote in the history of a government and a society that wishes to manufacture a national narrative that erases the stories and experiences of its victims. Chris Robertson is a printmaker who has dedicated his work to telling his own story and sharing the things that are important to him and to allowing people, through printmaking, to share their stories and empower others to create. This is the work he considers to be vital to the future and most helpful to his local community and beyond. Lorene Oikawa is an activist who speaks and writes about her passions, including human rights and her heritage. She is a yonsei, fourth generation Canadian, whose family migrated from Japan in the 1800s and 1906. Adachi, Ken. The Enemy That Never Was: A History of the Japanese Canadians. Toronto: McClelland and Stewart, 1976. Enomoto, Randy, ed. Honouring Our People: Breaking the Silence. Burnaby, BC: Greater Vancouver Japanese Canadian Citizens’ Association, 2017. Price, John. Seventy Five Years is Long Enough. Victoria, BC: University of Victoria, Centre for Asia-Pacific Initiatives, 2016. https://www.uvic.ca/research/centres/capi/assets/docs/MMP_Price_Working_Paper_v2.pdf. Roy, Patricia. The Oriental Question: Consolidating a White Man’s Province, 1914–41. Vancouver: UBC Press, 2003. Stanger-Ross, Jordan, Nicholas Blomley, and The Landscapes of Injustice Research Collective. “‘My land is worth a million dollars’: How Japanese Canadians contested their dispossession in the 1940s.” Law and History Review 35, no. 3 (August 2017): 711–751.